Successfully Added 5 Inch Touchscreen GPS w/FM Transmitter and Bluetooth + Camera to your Shopping Cart. This 5 inch touch screen handheld GPS navigator comes with FM transmitter, Bluetooth and a wireless rear view camera. 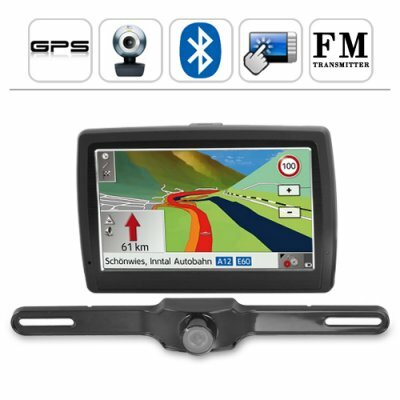 This GPS navigator also supports multiple digital media file formats such as MP4, AVI, 3GP, MOV, WMV, RM, FLV, RMVB for video playback and MP3, WMA, WAV, M4A, OGG, AAC, MIDI for music playback. This 5 inch GPS navigator comes with a wireless rear view camera that helps you reverse and parallel park with comfort and ease. The wireless rear view camera gives drivers the confidence in reverse and parallel parking. Further-more, installing this wireless rear view camera is easy and take a mere few minutes. This ip66 wireless rear view camera is designed to be able to handle the harsh weather of the outdoors such as snow, hail, rain and fog. A portable handheld GPS navigator is the way to go! They offer versatility, portability and above all, can be easily taken with you where ever you go. This 5 inch touch screen GPS navigator's FM transmitter along with the Bluetooth feature allows drivers to pair their cell phones with the GPS navigator and enjoy hands free calling and listening to your favorite music through you cars stereo speakers. In a nut-shell, you do not have to dismantle your vehicles dashboard and install a car DVD player if you don’t want to. Handheld GPS navigators with built in multimedia applications such as this particular one, offer users a variety of entertainment options from using it in your car, in the office, when hiking or camping, even in the bedroom. This 5 inch touchscreen GPS navigator and wireless rear view camera is a great electronic car gadget for drop shipper’s and eBay resellers. This multimedia 5 inch touch screen GPS navigational unit with Bluetooth and FM transmitter is in stock now, and available at a factory direct wholesale price directly from Chinavasion. The unit includes an evaluation GPS software - we recommend purchasing a GPS software package from your home country that best covers your region of the world. This is a rich featured GPS navigation and media system. We recommend carefully reading the user manual for your most satisfactory user experience. Does this unit support Greek language? If your GPS software support Greek, then the display and voice language will be in Greek. Most map software comes with a wide selection of language choices, which means both the display and sound (voice) will be in your preferred language. However, you should carefully select and buy the map software that is best suited for your region of the world.